Professor Haley was for a time the Chair of the chemistry department at the University of Kentucky. Here are some things I have had to say about him. Professor Haley won the Quote of the Year Award in the 2004 Millenium Awards for "mad child disease". I decided to ask Dr Haley some questions. If you had a cupful of mercury in front of you right now, how much would you be willing to drink to prove Boyd Haley wrong? And what would that prove? You might like to get Professor Haley to explain the concepts of "the dose makes the poison" and "threshold". That is, if he hasn't completely forgotten whatever chemistry he may once have known. All it takes to prove him wrong is to crack open an introductory organic chemistry textbook and read about what the prefixes "methyl-" and "ethyl-" mean. The last time I looked at the commercial web site of our old friend Professor Boyd Haley he was selling a test for Amyotrophic Lateral Sclerosis (ALS, or Lou Gehrig's Disease). He had developed the test himself based on research conducted by him alone. There was, of course, a treatment on offer, no doubt at considerable expense. I see that Professor Haley now has a new test which can reveal toxins in need of removal (which is a much more polite way of saying "dollars in need of removal"). 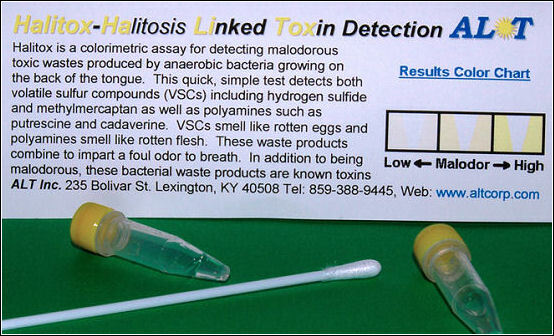 Apparently, if you have halitosis you are making your own toxins, so the test requires you to get a sample of your bad breath so that an appropriate treatment and payment schedule can be determined. Professor Haley might have forgotten the chemistry he learnt in high school, but he sure has a good imagination and a great eye for the main chance.